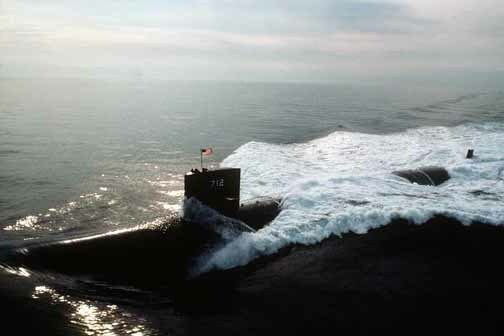 The USS ATLANTA (SSN-712), a Los Angeles class submarine, was commissioned on 6 MAR 1982. USS ATLANTA served her country for 17 years, 9 months and 10 days, until decommissioned on 16 DEC 1999. FEB 1986 - APR 1986 northern run-we bottomed in Gibraltar. The fifth Atlanta, (SSN-712) was laid down on 17 August 1978 at Newport New, Va., by the Newport News Shipbuilding & Drydock Co.; launched on 16 August 1980; sponsored by Mrs. Sam Nunn; and commissioned on 6 March 1982, Comdr. Robin J. White in command. The nuclear-powered attack submarine carried out shakedown training along the New England coast after commissioning. On 15 May 1982, she reentered the yard at the Newport News Shipbuilding & Drydock Co. for five months of post-shakedown repairs. Late in October, Atlanta began operations out of her home port, Norfolk, Va. That duty carried her through the rest of 1982 and almost all of the first six months of 1983. On 20 June 1983, the warship embarked upon her first overseas deployment. During that five-month tour of duty, she called at ports in Scotland, England, and Norway before returning to Norfolk on 23 November. In January of 1984, Atlanta cruised to the West Indies as a school ship for prospective commanding officers and then returned to normal operations out of Norfolk during the spring and summer. In September, the warship took part in a fleet readiness exercise "READEX 2-84" and then resumed duty out of Norfolk. The beginning of 1985 found Atlanta in port at the Naval Base, Norfolk, completing a restricted availability. In February,she practised torpedo firing in the Bahamas and took part in mine warfare drills near Port Everglades, Fla. March brought a weapons technical proficiency inspection, and in April, the nuclear submarine participated in the fleet exercise "COMPTUEX 2-85." Late that summer, she got underway for two months of operations at sea. The warship returned to her home port that fall and resumed duty in the local operating area. Atlanta spent the first month of 1986 getting ready for an overseas deployment. She embarked upon that assignment in February and returned to Norfolk later that spring. Following an availability at the Norfolk Naval Shipyard, Atlanta operated in the West Indies for a time early that summer. In August and September, the nuclear submarine took part in an eight-week NATO exercise that brought with it visits to a Canadian and a Norwegian port. She returned to Norfolk in October and resumed local operations along the eastern seaboard for the remainder of the year. As of the beginning of 1987, Atlanta was at Norfolk preparing for overseas movement.